Zak’s Cafe, at 231 S. 2nd Street, has been on my own personal list for quite some time. It’s right next to Ginger, which is a favorite to TJ and I. Constantly, I’m hearing their ad’s on 88.9 Radio Milwaukee, talking about fresh, local ingredients and it’s alway sounded appealing. We finally headed over there to see what the buzz is about. I think I was expecting a quiet, small place. Quite opposite, Zak’s is unexpectedly big inside! Along with the huge patio, there’s also a small upper flat – where we were seated after a short 5 minute wait. The staff was very busy and seemed a little flustered. But, my bloody mary came out quickly and my food was not cold so I didn’t care! Mix: If someone blind taste tested me, I would have categorized this with the Lowlands Group. It was thick and full of horseradish and pepper (you know – the floaties). Either they made it by order or they poorly poured because the mix spilled a bit, making the outside of the glass a bit messy. I’d say this was a very well done “classic Bloody Mary”. There wasn’t anything crazy about it but it stood out from some others in the area. It was simple. It was thick, tomato-y and full of flavor with not too much spice. Very good. 3/3/2014 Update: We went back to Zak’s for brunch over the weekend and saw the bartender carrying multiple bottles of ZingZang behind the bar. It made me kinda sad! Partly because the waiter on our first visit insured me the drink was homemade. Maybe he lied, maybe they switched the way the make the drink but it’s too far in between to know if the drink was the same. However, I do love ZingZang. Unfortunately, until proven differently, Zak’s has to go on our un-contender list. Garnish: I read a lot of reviews that had a massive shrimp included in the garnish. I didn’t get one though. Instead, I had 2 cubes of cheese, a small piece of beef stick, a green olive, pickle spear, lemon and lime. Nothing overpowering or crazy. I thought it was really good. This wasn’t a “full-kitchen” type of bloody and it left room for breakfast (I had the waffles and they were excellent). Like I said earlier, it was classically good. Chaser: For an additional $.50, I got a Miller High Life pony. Buzz: No buzz at Zak’s. Size: 16 ounces, served in a normal bar glass. Cost: $7.50. 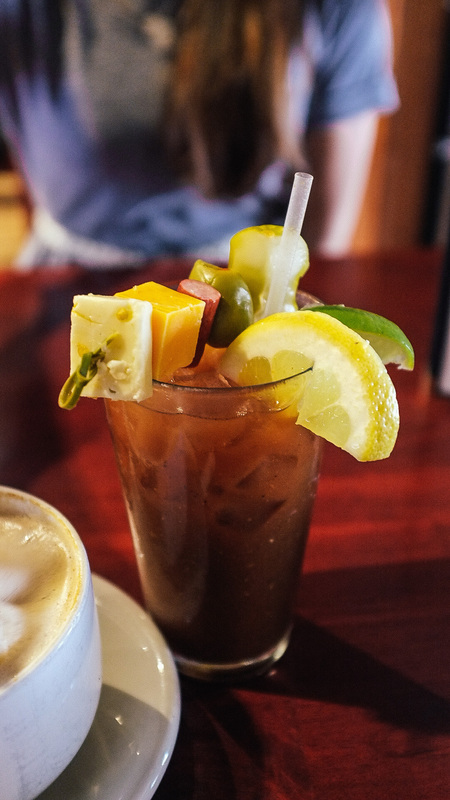 This is a very good price for this Bloody Mary… even a great deal! I hold Lowlands Group as a standard for Milwaukee as I’m a true believer in what they’ve got going on. Since Zak’s was possibly its conjoined twin, then separated under intense medical surgery, I was really pleased with seeing $7. Lowlands average at $9 so this was definitely worth the price. Zak’s was nice and I’d go back. I’m slightly curious about them because it seems like they’ve got a good thing going on. Except… the staff didn’t seem prepared for the volume of a Sunday brunch. I’m going to give them the benefit of the doubt and say maybe they were short one. I hope the next time we go, it’s a little more organized. For the bloody mary, I recommend it. If they had a better garnish arrangement, I’d consider moving this into the top contender spot. Go. Taste. What’s up with places these days charging for the beer back? It should just come standard. This entry was posted on September 15, 2013 by Shannon in Bloody Marys in the area and tagged 5th Ward, Bloody Mary, Classic Bloody Mary, Fifth Ward, Milwaukee, Walkers Point, Zaks Cafe, Zaks Deli, Zing-Zang.